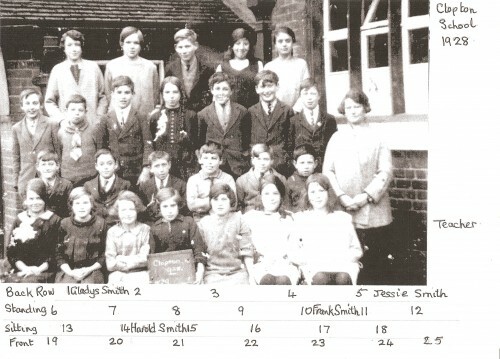 Clopton School - A photograph taken in 1928. Can you name any of the children in this picture? The following information was taken from Kelly's Directory of 1900. A School Board of five members was formed compulsorily on 22nd December 1873. Samuel W Creasy was appointed Clerk to the Board. The Board School and house was built in 1875 at a cost of £1.700. There was accommodation for one hundred children but average attendance was fifty six.